Manufacturer of a wide range of products which include centrifugal chemical process pump for textiles industry. Centrifugal Chemical Process Pump for Textiles Industry offered come designed and developed using latest technology support and can be made available in different operating configurations so as to perfectly match up with the demands in the textile industry. 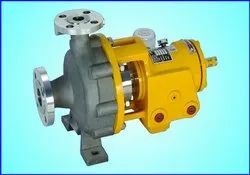 Further, the dimensions of pumps are also in compliance with DIN & EN standards. Some of its features include sturdy armour in ductile cast iron finish; a closed impeller that provides for low axial thrust; comes with superior corrosion protection for metallic components; allows for easy maintenance and low operation noise; can be offered in a flow rate of 2 to 650m3/h and lift the head of 3.5 to 150m.